The burglar who’s suspected of breaking into at least three Boystown-area businesses last month is still on the loose and doing his thing, according to a new community alert from Chicago police. Despite being captured on surveillance video August 16th as he prowled his way through The Alley, 3221 North Clark, the man has eluded police for over a month. Now, police say he broke into a small retail shop in the 2200 block of North Clark Street early on September 13th. He’s also suspected of burglarizing retailers in the 2000 block of North Sheffield and near the Brown Line station in the 900 block of West Armitage, detectives said. 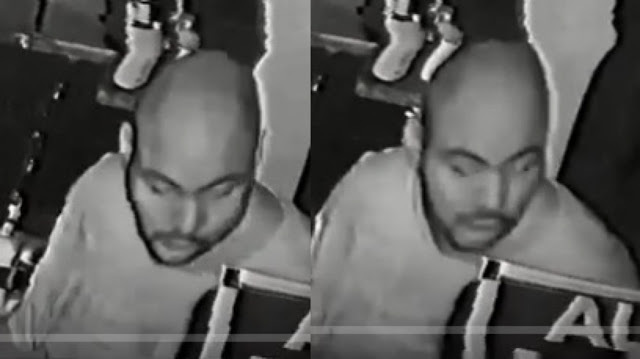 In addition to The Alley, police say he used a pry tool on the rear door of Roscoe’s Tavern 3356 North Halsted around 5:30 a.m. on August 16th; Diva Thai and Sushi Bar at 3542 North Halsted early on August 18th; and an unnamed establishment in the 4000 block of North Sheridan sometime between August 12th and 14th. His technique has not changed since he swung through Boystown: He uses a tool to pry open doors and then helps himself to cash register contents and merchandise. Police say the man is African-American, 5’8” to 6-feet tall, 200 to 240 pounds, with a bald head and a beard. Anyone with information about the suspect can contact Area Central detectives at (312) 747-8380.